Now that it has finally cooled off, it’s time for BeeGee to start joining me on mountain bike rides. I am really pumped about this and I bet she will be too. Unfortunately, with the move from North Carolina and the heat of south Texas, I have neglected our weekly runs. So, I have put together a small guide to help you guys get ready to run with your pups (and help me!). This article was updated December 16, 2014. First things first, ensure your dog is healthy enough to even begin training with you, which should be done by your veterinarian. Moreover, pets that are too old or too young shouldn’t run either. Young dog’s bones are still developing and training should wait until they are over 6 months. Furthermore, large and giant breeds need to wait even longer, around 18 months. As for older dogs, that is harder to set a specific time frame, so just be safe and consult your vet. One of the most important parts of running with you dog is good leash skills. This might be the hardest part, but training your pup to run next to you and not pull can be a huge challenge. Also, you must teach your dog not to step every few feet not to mark to prevent frequent breaks. A gentle tug on the leash and saying, “let’s go” works well with BeeGee. Just like people, dogs need to slowly build up as they get in shape. For beginners with no cardio training, I recommend just regular walks to start with. This gets the pup ready by strengthening/toughing their pads, increasing their cardio a little, and familiarization with leash rules. The next step will be adding short 5-minute jogs into your regular walks 2 – 3 times a week. After a few weeks, increase the jogging time to 10 minutes. This should provide a nice base for your dogs and maybe you. Finally, start running 3 times a week. BeeGee and I have started with 2-mile runs 2 to 3 times a week, but time based runs might work better. I would start at 15 to 20 minutes per run. Finally, add about 5 minutes per run every week. 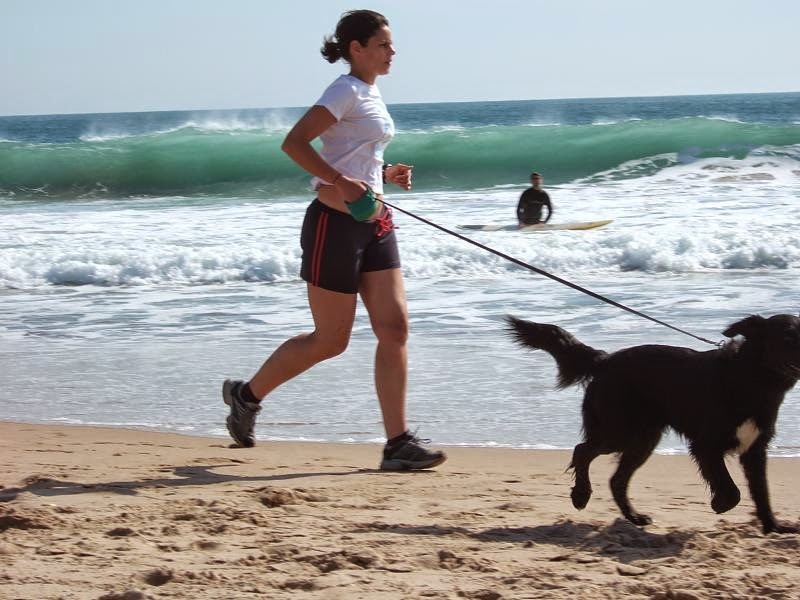 During a run using a leash, it is extremely important to keep control over your dog. By not keeping control of your dog, you risk injury to yourself, your dog, and innocent bystanders (other runners or squirrels). First, keep your dog on leash. It will keep your dog out of danger and it will make everyone else feel a little safer, even if your dog is perfectly trained. It's just a matter of courtesy. Second, you must remember it’s a run not a walk or fun time. Next, no stopping to sniff or mark. These kinds of sudden stops because of your dog can result in injury to you or your buddy. Like you falling over your dog or a quick painful jerk to your dog's neck. Keeping control of your dog can be made easier with the right equipment. This can be accomplished by using a good leash and a collar or harness. I don't recommend training (choke chains or pinch collars) collars because this can decrease the efficiency of your dog's breathing. If the collar is tight throughout the run it will make it a lot harder if your dog isn't getting the oxygen she needs. Furthermore, if your dog is a known puller, try using a good harness. This will take the pressure and jerks away from their necks, which will allow them to breathe easier and reduce injury causing neck jarring. Finally, consider a leash with a little give. This will also take out some of the sudden, hard jerks. Sometimes we bite off more than we can chew, don’t fully recover, or have a bad day, and our running buddies are no different. If you start seeing any of the signs below, take a quick stop, wait for your dog to recover, and then continue again at a slower pace. If the signs persist, it’s time to call it quits and walk on home. After you finish up your awesome run and cool down, it’s pretty important to check out your dog’s paws. Unfortunately, our dogs can’t talk and let us know their issues, so we have to give them a once over. Start by checking for cuts, scratches, and worn down pads on their paws. Then examine their coats for burrs, ticks, or any other material that could be matted in. Finally, watch your dog’s gait (aka their walk) to see if they are limping. After you've given them an inspection, its time to let them cool off before you let them drink water or provide a snack. However, once they have cooled down, make sure you provide plenty of water and a post work out snack. BeeGee working on her sprints! It is great that you want to get out there and run or bike with your pup. I hope this short guide has helped you decide to start training with your dog because it’s so much more fun running with someone else. Especially with man’s best friend! 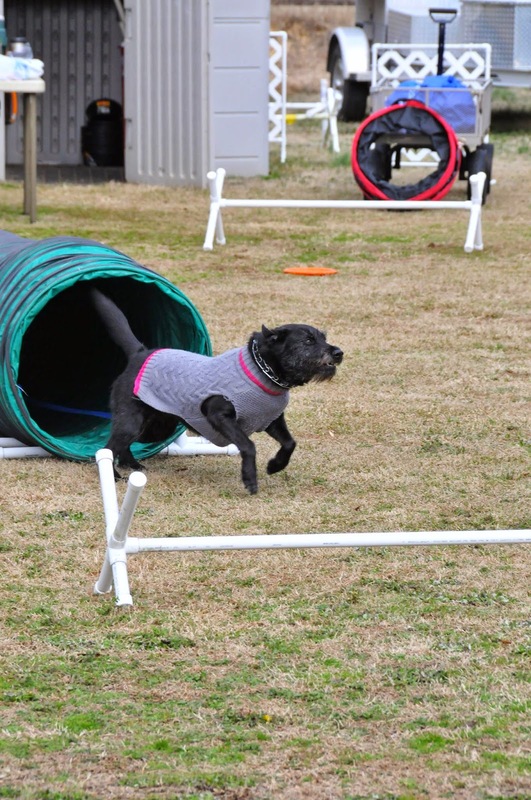 How have you been training with your dog? If you like the blog, go ahead and follow us on Facebook.